A range of machines for the automatic, accurate application of multi-colour decals to many flat, curved and cylindrical items, and on many substrates, not just ceramic ware, eg candles, glass bottles, ceramic tableware, glass tumblers, saucepans, tiles, mugs, stainless steel, bicycle frames, architectural glass, chopping boards, shower doors, beer tankards, spark plugs, in fact, any item whose perceived value would be enhanced by superior brand imaging or decoration. Reel-to-reel decal application machines can be built to your particular specification, and decal systems can be developed to suit new materials and applications. The manufacturer can also print the transfers for you. Cost-saving - you will be able to decorate your products more accurately, using fewer operatives, in a smaller space, with less wastage. Fast set-up (usually 5-10 minutes). 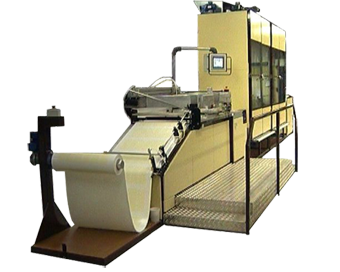 Changeover of a pattern, when the machine is already set up for the shape and size of article will take less than 3 minutes, which means that you can decorate small runs and produce, say, 50 of one pattern, 20 of another, and 30 of another, very quickly and easily. Decal positioning is consistently accurate. Colours are sharper and in perfect register. Items requiring firing (glass, ceramic, vitreous enamel), can be fired immediately after decoration. Because there is no water involved, there is no frizzle or blow holes. On candles, the print becomes an integral part of the surface of the candle, to give a far superior aesthetic value. You can increase your production capacity by up to 2400%. You can take an order one day and despatch it the next with no storage or double handling of the product, which means lower labour costs, less floor space needed and higher profits. The job takes about one twentieth of the time to complete, it is finished and delivered, and the invoice can be presented and paid faster. Screenprinting press designed without compromise, and producing the highest quality printed decals. Prints ceramic and organic colours as well as precious metals, lustres etc. Gives dot for dot registration and is not reliant on precise environmental control. The package comes complete with press, dryers, rewind units and finishing tables. Available in 2 standard size formats - 52 cm and 76 cm. Please note that printing machines can be built to your size and print requirements. Full technical support and backup will be supplied, together with a development programme designed to meet your customers' requirements. For more information on reel-to-reel heat-release systems, contact us.